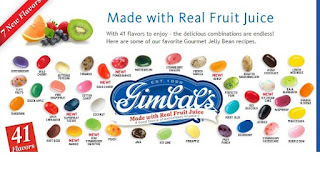 Gimbal’s Fine Candies has been around since 1898 and I tried the Gourmet Jelly Beans which comes in 41 flavors that are delicious unbeatable quality. Created in an exquisite array of colors, the Gourmet Jelly Beans are packed with Antioxidant Vitamin C and burst with real juice and intense flavor all the way from the chewy center to the delicate shell. The flavors are Boysenberry, wild cherry, tutti frutti, tangerine, green apple, butter popcorn, pink grapefruit, spicy cinnamon, root beer, tiramisu, cotton candy, superfruit fusion, mango, sour cherry, pomegranate, kiwi strawberry smoothie, each, watermelon, java, strawberry daiquiri, key lime, French vanilla, pineapple, honey, perfectly pear, very blue, fruit punch, roasted marshmallow, red delicious, strawberry cheesecake, licorice, wow! Chocolate, ice cream, raspberry, lemon meringue, balia margarita, orange & crème, pina colada, and bubblegum. Licorice Scotties Made with only the finest ingredients, each Licorice Scottie Dog is handcrafted with Real Licorice Root and Pure Anise. Soft, delicate and bursting with flavor, the All Natural Licorice Scotties are made for the real Licorice Lover. Sour Gourmet Jelly Beans comes in 12 incredibly scrumptious flavors. Made with Real Fruit Juice and a good source of Antioxidant Vitamin C and positively sour! The flavors are sour cherry, sour apple, sour mango, sour grapefruit, sour blueberry, sour lime, sour grape, sour pomegranate, sour watermelon, sour lemon and sour tangerine. Cherry Lovers are fruit chews with real cherry juice and are high in Vitamin C. They come in 9 delicious chews which are wild cherry, cherry vanilla, kiwi cherry, cherry cheesecake, bing cherry, cherry daiquiri, black cherry and cherry cola. My Opinion: I really enjoyed the gourmet jelly beans and try and figure out which ones I put in my mouth some are easy and others were challenging. The Licorice Scotties are cute shaped like a Scottie dog and I gave them to my dad as he loves licorice. The Sour Gourmet Jelly Beans were very satisfying for the sour craving I was having and the Cherry Lover is shaped like a cute little heart. I would live to try the pins colada! Would love to try the Baja margarita flavor!!! The Roasted Marshmallow would be the first one I would try. I'd like the sour ones! Cinnamon Lovers flavor sounds terrific to try. 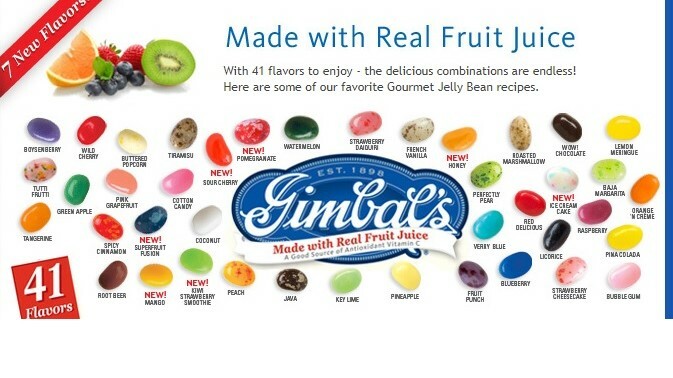 I love taking Gimbals Jelly Beans on road trips, they really have some awesome flavors. My favorite one is probably Java and I like the recipe for Mocha Latte! The Gourmet Jelly Beans sounds wonderful! All Natural Licorice Scotties are cute and I would love them. I know I would enjoy the Cherry Lovers flavor, it sounds tasty! Cherry Lovers candy does sound very tasty and fun to try.